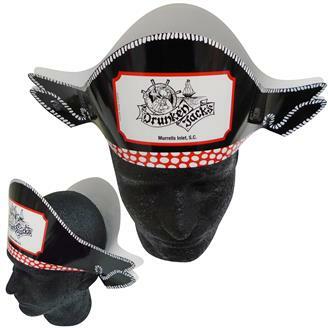 Pirate hat made from 14 pt., white high density poster board. Your custom message or logo will sure to be notices! Liquid laminated for a high gloss finish. Quick turn, just ask. Includes preprinted stock graphics. Ideal for themed parties, events, holidays, costumes and more. Shipped flat with minimal assembly.